The Russian Central Bank has cut its key interest rate to 15 percent from 17 percent due to the 'shift in the balance of risks of accelerated consumer price growth and cooling economy,' according to a statement from the regulator. The 200 basis point cut comes a month and a half after the bank raised the rate to 17 percent on December 16 in a failed attempt to control the massive devaluation of the ruble. Growth in Russia slowed in 2014, and isn’t expected to have expanded more than 0.5 percent. The Central Bank forecasts GDP will fall by 3.2 percent in the first six months of 2015, compared to the same period last year. A rate cut had an immediate negative effect on the ruble and Russian stocks. The unexpected change immediately sent the ruble down to a rate of 71 rubles against the US dollar, meaning the Russian currency has lost more than 17 percent of its value since the beginning of 2015. In 2014, the currency weakened by 46 percent. The ruble tumbled to more than 80 against the euro. The rapidly depreciating ruble has led to a surge in inflation, or consumer prices, in Russia, which the bank thinks will cool down in relation to the ruble. The "accelerated price adjustment to the ruble depreciation is time-limited," the statement said. At the end of 2014 inflation reached 11.4 percent, and as of January 26, 13.1 percent. By 2016, the regulator estimates consumer prices will fall to 10 percent. Higher interest rates make it more expensive to take out loans from banks, and therefore can discourage economic growth and activity. Russian companies have been asking for a rate cut since the hike to 17 percent from 11. 5 percent in December, this made new loans more expensive and stifled production. 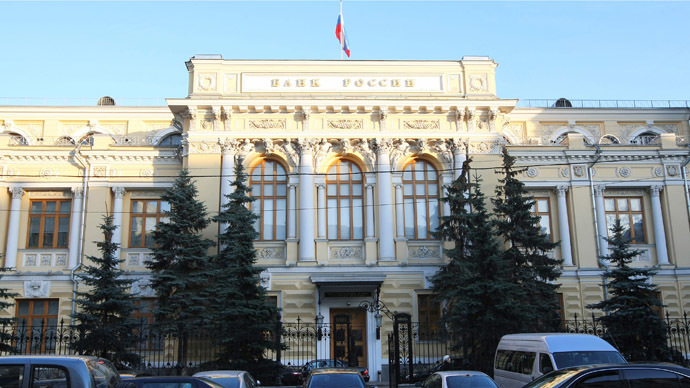 In November the Central Bank initiated a free-float regime in order to stop burning through country's foreign currency reserves to support the ruble. Russian Deputy Prime Minister Igor Shuvalov told Sputnik news that switching the ruble to a free-float regime is "extremely painfully, but completely justified and correct." Inflation will start to wane in the second quarter of 2015, according to the Russian Central Bank. “Inflation and inflation expectations are forecast to decrease as the economy gradually adjusts to changing external conditions,” the bank's statement says. Weighing heavily on the ruble is also the price of oil, which is pushing down the ruble, the two falling in tandem. Russia's budget is more than 50 percent dependent on oil and gas exports. The regulator didn’t give any indication about future plans for interest rates, a segment usually included in the monthly interest rate meeting statement. Regularly the directors give a hint about future policy changes. December 2013 was the last time the bank omitted any future economic sentiment signals in its monetary policy decision. The bank next meets on March 13.